Amalfi Coast Italy Wedding. Anne and Eric had already cultivated a wedding vision in Italy before he even proposed. So, when he finally asked that all-important question, there was no doubt on where they would tie the knot. 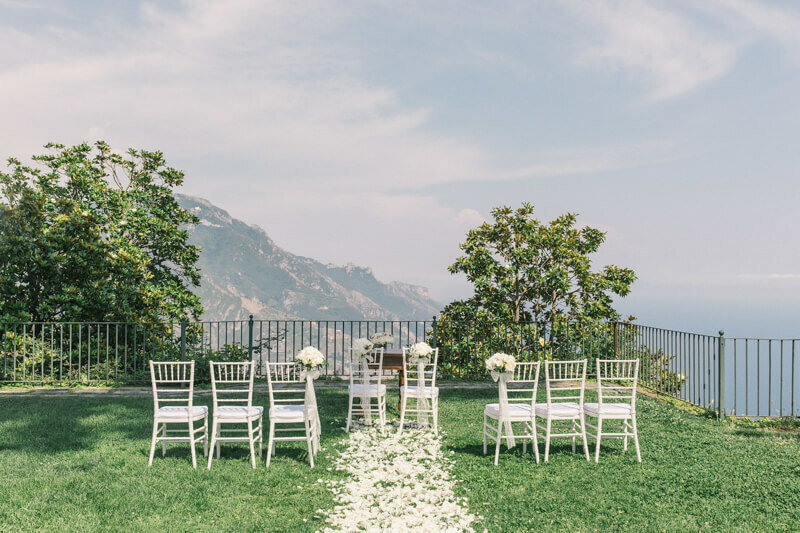 After falling in love with the Amalfi Coast during a summer vacation, they yearned for a small 10-person week-long event that culminated in a simple, yet love-filled ceremony. Italy’s Amalfi Coast is majestic with its hilltop villas and terraced vineyards. 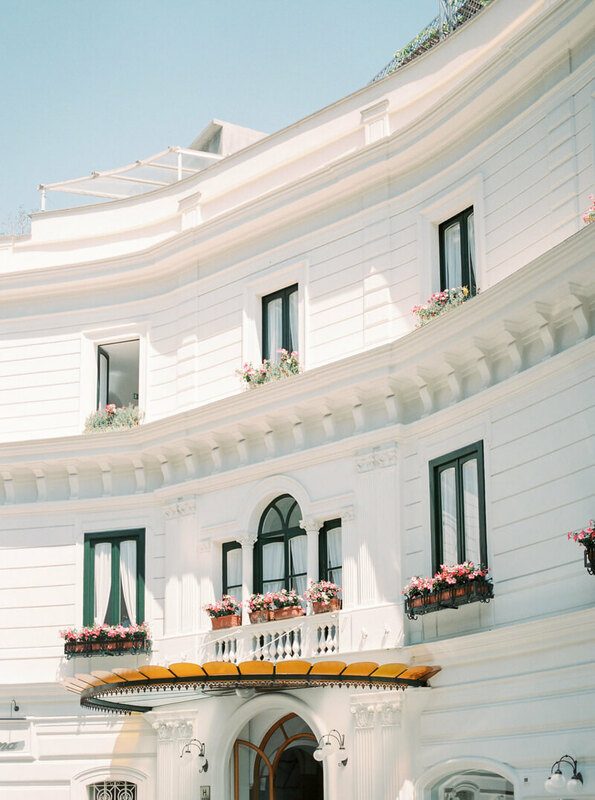 The Santa Caterina Hotel, with its immaculate architecture and awe-inspiring views, was the ideal spot for their intimate nuptials. 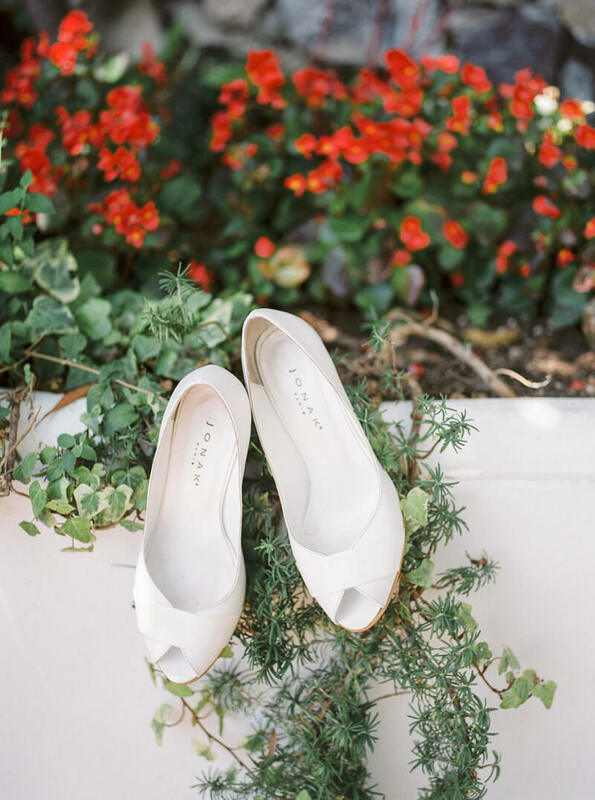 With a small wedding, the details truly stood out, like Anne’s peep toe heels, the charming and personalized invitation suite and of course, the bride’s choice of peonies throughout the day. Accessories are important to the groom, too! Eric looked eager and delighted to get married in a dark suit, gray patterned tie, white rose boutonniere and personalized cufflinks. On a private lawn overlooking the water, six white chivari chairs were set out for the small group of guests. An aisle was created with flower petals and at the top, two chairs were placed for the bride and groom. They said “I do” in front of their most cherished loved ones and stood for photos in the warm Italian sunshine afterwards. Anne’s gown was perfection with its flattering fit-and-flare silhouette and lace fabric. The now husband wife took a stroll down some of the nearby streets, pausing for kisses and soaking in the beautiful waters off the coastline. Their petite reception took place at a local restaurant, where the group dined under a vine-covered ceiling surrounded by expansive views of the water. The wedding cake was a three-tier pink and white dessert featuring pearling on the layers and floral embellishments on the base and top. The small group was able to genuinely immerse themselves in the celebration of Anne and Eric, sharing stories, laughs and conversation amid candlelight. Just because you want a small wedding doesn’t mean it can’t be the wedding of your dreams. Anne and Eric knew they wanted a destination wedding with a small guest list. They enjoyed a wedding with all the splendor of the Amalfi Coast while focusing entirely on the things and people that matter most to them.